It does not matter what type of workplace you are working in, there is always a chance of getting injured. 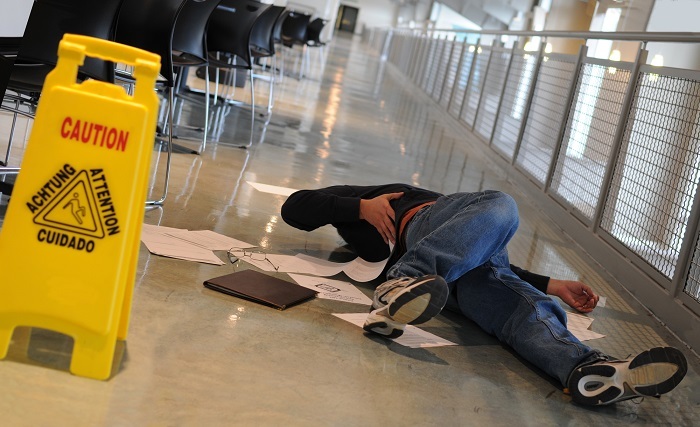 The most common reasons why so many individuals end up with severe injuries are slip and fall. Did you know that almost 60 percent of all worker’s compensation claims are due to a slip and fall accident? Listed below are common causes of slip, trip and other injuries related to falling at the workplace. One thing we all have in common is rushing to get things done. Whether the shift has just started or it is time to go home, we tend to speed up and try and get everything done as quickly as possible. This is when mistakes happen; even the slightest loss of focus can cause mistakes to occur. Getting distracted while walking or walking faster than usual can cause a loss of balance, ending up with a fall injury. If you are feeling extremely tired at any point of your working shift, you should take a moment and get some rest. Usually, a glass of water or a dose of sugar intake may help. However, continuing to work in such a condition can cause you to lose your balance and end up on your back, as your eyes and your body are not in sync. If you do end up getting injured by falling on your back, for whatever reasons, contact the Los Angeles Workers Compensation Attorney as quickly as you can and let them help you file a worker’s compensation claim. Many workplaces have areas that need to be cleaned often. These areas tend to be wet and when walked over, could cause the person to slip and fall. Stay on the lookout for the “slippery floor” sign and if you see one, do not walk over the wet area without being extremely cautious. The best thing you can do is find another way around and thus minimize your chances of slipping. If you are carrying boxes or something heavy, you may lose your balance and end up getting injured. Also, if the surfaces you are walking on are unequally balanced or loose, that increases the risk of slipping and falling. It is your job to be extremely careful and walk with caution. Be aware of the consequences of getting injured, and always stay on the lookout for loose cables, wiring and other things that may trip you. If you end up injured, you should call Workplace Injury Attorney in Los Angeles and schedule a free consultation to determine whether or not you are eligible to file for workers compensation.